No creature provokes such astronomical panic while presenting such infinitesimal physical danger like the bedbug, an insect linked to no diseases whatsoever. Bedbugs irritate, certainly: they bite your legs, disturb your sleep. But the extreme fear of them—the sense of shame that surrounds a bedbug infestation—stems not from anything rational, but from the instinctive sense that something debased about us has been confirmed. “Man still bears in his bodily frame the indelible stamp of his lowly origin,” Darwin once wrote. He was noting the pattern of animal descent he described in On the Origin of Species, but we also bear our vestigial lowliness in the litany of bugs that randomly cling to the human body: lice, scabies, fleas, ticks, and of course, bedbugs. These pests joined us at our simple beginnings, and they remain the most uncomfortable of all equalizers. They ride us like any other member of the animal kingdom; they infest us, feed upon us every day. 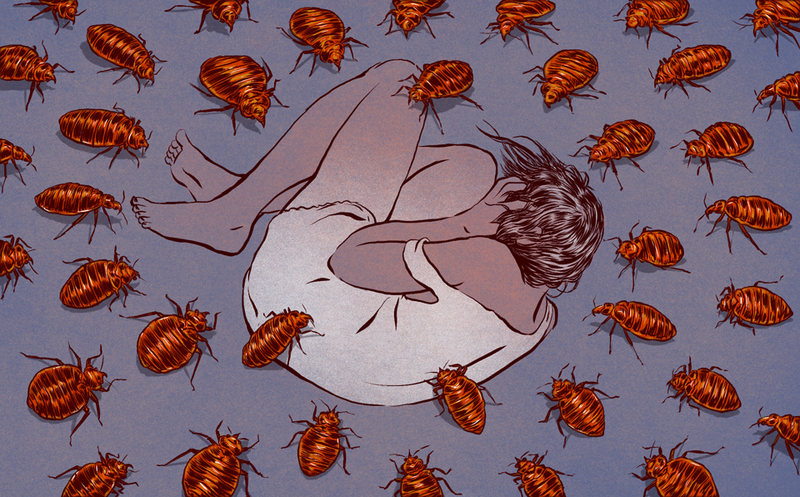 Maybe it’s surprising that bedbugs remain such a powerful drain on our mental resources. Bedbugs have been the focus of human ire ever since we emerged from the antediluvian sludge where it’s likely that these insects laid in wait, born hungry for a fresh meal. We’ve exerted an immense amount of brainpower on their eradication. And yet, despite our best attempts, we cannot thwart a nature that made bedbugs so damningly hard to kill. The bedbug has been with us since near the beginning of recorded time. The fossils of the bugs have been found at Egyptian sites, likely dating between 1352-1336 BCE; written references seem to exist as early as 432 BCE. They were described in detail by Pliny the Elder, the great Roman naturalist, in his encyclopedic work Naturalis Historia. Pliny simply called them cimex—Latin for “bug.” It was the tireless taxonomist Carl Linnaeus who would finally give them their modern name, cimex lectularius, which means “bed bug,” or “bug of the couch.” But Linneaus was a creative man, descended from sternly resourceful Lutherans. He didn’t see the bugs simply as foes, but also suggested instead that they might be used to ease earaches. References didn’t come only from the West, either—as early as the seventh century, China too recorded the pestering presence of the bug. Turpentine might be the least interesting—and likely the least dangerous—method that humans have used to eradicate the bugs. Eighteenth-century philosopher John Locke preferred a more natural treatment: he suggested that placing dried leaves from kidney beans under the bed would keep the bugs from snuggling into the bed. But in general, poison was the tonic of choice: Mercury, Zyklon B, and good, old-fashioned arsenic have all been employed against bedbugs. And when poison proved useless, fire was the element. In the nineteenth century, smoke from peat fires were used to fumigate Victorian homes, and blowtorches were recommended in the early twentieth century. The human search to eliminate the bedbug was so ever-persistent that, in the 1920s, the U.S. Patent Office created a special designation to track bedbug-related inventions. And yet, despite these efforts, the unwelcome bedfellows couldn’t be stopped. Their thirst for slumbering human limbs was too strong for even a housewife’s homemade potion of mercury and arsenic. It was the discovery of DDT’s (dichlorodiphenyltrichloroethane) insecticidal abilities that would stop bedbugs in their disgusting tracks. DDT wasn’t exactly a new discovery in the 20th century—it had first been synthesized in the 1870s—but in 1939, Swiss chemist Paul Hermann Müller discovered that the compound could be weaponized against bug populations. And so, in our zeal to eliminate insects, humans blanketed DDT on nearly every inch of earth in the Western hemisphere. DDT proved incredibly effective; it was used to control the spread of insect-borne infectious diseases during World War II, keeping malaria, typhus, and other diseases that had previously wreaked havoc on soldiers in tight, unhygienic spaces, at bay. It was so effective in World War II that, in the post-war period, it was widely used as in the United States as common insecticide. DDT was a kind of magical invention: colorless and nearly odorless, it allowed crops to bloom without infestation and allowed an entire generation to enjoy the leisurely spaces of backyards. In fact, DDT was so successful at eliminating that bedbug that, as Borel points out, baby boomers grew up “blissfully unaware of the bedbug… as did their daughters and sons, knowing only that it was something that existed when their parents were young.” Nonetheless, chemistry can’t trump evolution. While entire generations slumbered peacefully, their beds free from blood-drinking parasites, the surviving bedbugs lay in wait—and the ones that survived the pesticide clouds of the 1950s continued to mate. In the process of eliminating the bedbug, DDT had essentially produced a super bug of sorts: a bedbug that had adapted to major component of pesticides that attacked the nervous system and reduced most bugs to twitching half-dead heaps before ending their lives entirely. And of course, it turns out that a pesticide that attacked the nervous system of anthropoids might not have been particularly kind to the health of humans and other mammals. In 1972, a decade after Rachel Carson published Silent Spring, the United States banned DDT. Man using RIPA insecticide to kill bedbugs, c. 1900. Image via Wellcome Collection. New Yorkers, in particular, were struck by the bugs—the garbage of Manhattan had been, it turns out, the perfect place for the bedbug to hide from DDT. In 2010, bedbugs took up residence at a Fifth Avenue Juicy Couture store, at the Fashion Institute of Technology, and at Elle magazine who hired a “specially trained sniffing beagle,” to confirm the office’s infestation. Nearly all of the stories written about the bedbug resurgence took a kind of grim delight in the infestation of places seemingly too highbrow for something as lowly as the bedbug. People were reassured that it just wasn’t their dingy apartment overrun by insects, it was also the dwelling spaces of the elite. Infestation, unlike most everything else, seemed genuinely democratic. And so our age-old quest to effectively eliminate an entire species began anew. The only problem was that, by 2010, we had forgotten about how to deal with bedbugs. The invention of DDT not only stopped the development of any other aggressive pesticides—it also stalled our knowledge of the creatures. We had banished both the bug and our cultural knowledge of them. Researchers began digging back into the old literature about the bugs, and there they effectively found nothing, coming out with little more to offer than the dried leaves of kidney beans. Part of the old problem with eliminating the bedbug resurfaced, which was that no one could figure out where they originated from. Knowing the bedbug’s point of origin, scientists believed, would help establish their evolutionary development and therefore lead to the development of an effective pesticide. But, just as the post-DDT population of bedbugs had seemingly come from nowhere, the bedbug proper seemed to be much the same. It’s believed that the bedbug originally originated in the Middle East, where humans dwelled in dark caves, surrounded by bats—that our cavemates gifted us the cimex lectularius. But that’s, of course, conjecture; bats tell no secrets. In Kentucky, the first bedbugs during the resurgence were found in the homes of Sudanese refugees known as the Lost Boys which made…[researchers] wonder whether these bedbugs…had come from Africa. Overseas, it was no different. In England, one expert told me that some people blamed immigrants from Kenya, others said the bed bugs were imported by fellow Brits who took holidays in Turkey, and still others claimed that the source was a piece of luggage from Australia. But none of these conjectures proved true. Today, bedbugs still seem to be both from everywhere and nowhere. Falsely, we cling to some vague reassurance that they’re definitely not native to the places where we live. Bedbugs can’t possibly originate from an urban, modern habitat, we tell ourselves; they must have come from elsewhere, some pre-modern landscape—best signified in the modern era by the immigrant. Bedbugs have to be foreign. If not, what does that make us? People who once lived in caves, surrounded by bats? We’re still unable to find a point of origin. And so, with every bedbug infestation, humans begin a historically familiar dance: they throw out mattresses, obsessively wash linens and clothes, squash the bloodsuckers when they showed their faces, resort to homemade remedies. The routine, no matter how well choreographed, has little impact on the bedbug’s proliferation. It endures, a disease incarnate—despite being repeatedly proven to cause or carry none. That medical innocuousness, at least, has been proven. In the early twentieth century, a British physician experimented on lepers both at home and abroad, to see if the bugs could carry the disease or transmit it; they could not. In the 1970s, scientists worked to see if the bugs could transmit hepatitis B, a disease whose virus particle had been discovered at the start of the decade; they could not. And in the 1980s, entomologists worried that the bugs could transmit the AIDS virus. Again, they could not. So why, then, are we so afraid of bedbugs? It’s the sense, maybe, that our attempts at civilization have been for nothing. We are still susceptible to foreign invaders, unwelcome and unwanted, who can pierce through our flesh and draw our blood when we’re most vulnerable. The private bedroom, a relatively modern invention, is not the space of intimacy or the oasis from the ills of the public sphere that HGTV would have us believe. Bedbugs can penetrate it—signifiers of disease they will never carry, almost Gothic in their intentions to invisibly debase. The bedbug disrupts our dreams, weaves itself into our subconsciousness. It’s the stuff of nightmares. And the ultimate nightmare is a stranger snuggling up in our bed, reminding us from what lowly places we came.